Water content is a critical aspect of many industrial processes, so the ability to accurately monitor relative humidity is crucial. Sean Ottewell reports. The Vaisala DMT132 HUMICAP dew point transmitter is an affordable new dew point transmitter for verification of the refrigerant dryer functionality. It is especially well suited for OEM dryer manufacturers. The DMT132 offers accuracy of +/-1°C in the typical operating range of refrigerant dryers, is quick and easy to install directly into dryers or compressed air lines, and has power requirements as low as 10v DC. The DMT132 incorporates the proven Vaisala HUMICAP sensor, which is resistant to compressor oil and most other chemicals, thereby providing excellent long-term stability (Fig.1). Vaisala offers a wide range of reliable, easy-to-use dew point meters for compressed air applications, from configurable transmitters with graphical displays to miniature OEM meters. Its product family includes equipment for the full range of environmental conditions, from very dry to more humid. Spot-checking is easy with the compatible hand-helds, either the Vaisala DRYCAP hand-held dewpoint meter DM70, or Vaisala HUMICAP hand-held humidity and temperature meter HM70. Direct refrigerator dew point measurement provides accurate information about dryer functionality and is more reliable than the traditional method of measuring refrigerator temperature only. Knowledge of the real dew point ensures high quality compressed air at all times and enables customers to optimise dryer capacity. As well as helping to prevent investment in redundant dryer capacity, this also helps to avoid unnecessary maintenance and costly malfunctions. Other new products from Vaisala include the HUMICAP humidity and temperature transmitters HMT120 and HMT130, both of which are designed for humidity and temperature monitoring in cleanrooms. They are also suitable for demanding HVAC applications. In another development, the company recently showcased its integrated Vaisala Veriteq continuous monitoring system (CMS) at Interphex 2011. The world's largest pharmaceutical and biotechnology companies rely on the Vaisala Veriteq CMS to monitor temperature, humidity, differential pressure and other critical parameters in their highly demanding controlled and regulated environments. The Vaisala Veriteq CMS ensures fail-safe, gap-free data recording to enable full compliance with the strictest FDA requirements. Vaisala Veriteq validation systems are powerful, easy-to-use alternatives to thermocouple-based equipment and bulky data acquisition systems. They are designed for the most critical validation and mapping applications in controlled environments. Vaisala also chose Interphex to provide updates on the Vaisala-Veriteq acquisition: the traditional Vaisala instruments, Veriteq loggers and viewLinc software have now been integrated into one solution, providing more options and versatility for pharmaceutical and biotechnology customers. GE's new PM880 AC hygrometer is a complete, portable system with options and accessories to meet all industrial moisture measurement needs. This hygrometer is small, lightweight, and easy to use. The large LCD displays moisture readings in dew point (°C or °F), ppmv, ppmw, lb/MMSCF (natural gas), and a variety of other unit options. Data can be viewed in alphanumeric or graphic formats. A 120 or 230v AC power supply allows for continuous operation of the analyser. The PM880 AC comes in a soft carrying case with zippered compartments, a handle, and a shoulder strap. The case accommodates the PM880 AC, a sample system, flexible hosing, probes with protective covers, a moisture image series probe electronics module, an operating manual, power supply, and probe cables. The carrying bag is safe for transporting the PM880 AC and accessories around a site. This rugged, line-powered, portable hygrometer measures moisture in gases and non-aqueous liquids. It is used in conjunction with moisture image series (MIS), TF and M series moisture probes for applications including: chemical and petrochemical gases; non-aqueous liquid applications; air separation plants; tanker preparation and filling; industrial gases; gas cylinder preparation and filling; furnace gases/heat treating; and general plant/facility maintenance. GE's moisture monitor series 35 IS (MMS 35 IS) portable hygrometer is certified intrinsically safe, is battery powered, and is housed in a damage-resistant case. When purchased with the internal sample system option, a built-in moisture probe and sampling system with process connections are included, making it a completely self-contained hygrometer system. 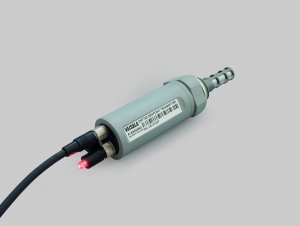 If purchased without the internal sample system package, the MMS 35 IS requires an external moisture probe connected to the hygrometer by a cable. Other options include computer-enhanced response, data-logging capability and a carrying case that provides protection for the instrument in addition to convenient pockets for accessories. In terms of applications, this model is designed for portable installations and is used in conjunction with M Series moisture probes for industries including petrochemical, industrial gas, furnace gas/heat treating, power generation, air drying, and pharmaceuticals. Meanwhile the company's DewPro MMY245 moisture analyser is a convenient, portable instrument that can quickly spot check the performance of gas dryers for compressed air, breathing air, and pure gas supplies. 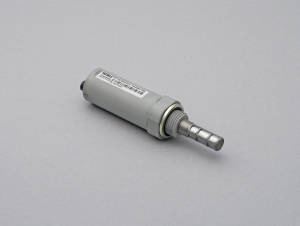 The planar capacitive sensor combines accurate dew point measurement with fast response time. The sensor is stored in a very dry environment within the analyser between measurements, which speeds response time. The MMY245 can be configured according to the desired moisture unit of measure, temperature unit of measure, or other operating parameters. An optional pressure sensor provides real-time correction for concentration units of measure or a pressure constant for use with stable pressure measurements. New from Rotronic, the HygroFlex7 is designed to defy all adverse conditions as the company's engineers have managed to make it even better than its predecessor. For example, the HygroFlex7 with cable mounted probe can withstand temperatures of -100-150°C whereas the wall version can be integrated into applications covering the range of -80-100°C. The humidity range is 0-100% RH, the humidity accuracy +/- 1% RH; and the temperature accuracy within +/- 0.2K. The model range is available as a wall, cable and duct version and with the optional HW4 software, many useful functions can be activated, such as an automatic sensor test or drift compensation. In addition to that, the output signals are freely scaleable. Rotronic also produces a range of handheld instruments suitable for all applications, especially where precise measurement of humidity and temperature is of importance; for example the food and pharmaceutical industries, printing and paper industries, climatic testing, research, education, sciences, meteorology, agricultural sector and climatology. These products are described in two groups. The first concerns climate measurement. Here HygroPalm is the very latest in handheld instrument technology with the highest performance specifications. Digital interchangeable probes simplify calibration and enable the user to fit alternative probes to suit different applications. The second is RH measurement in paper and card, the current range for which offers optimum features for production, quality, merchant and consultant users. Handheld instruments are also used to measure moisture levels in products such as powders, granules, seeds, food and pharmaceuticals.